still stands in Calvert today. As the Houston & Texas Central Railroad crept northward in the years after the Civil War, boomtowns sprouted up like weeds along its route. Dreams of prosperity drew many to these instant towns, though most of these settlements soon faded as the fortune seekers moved elsewhere once the economy stalled. The story of Calvert and its Jewish community follows this same pattern. Calvert was founded in 1868 when the railroad was built into Robertson County. The earlier settlement of Sterling moved itself two miles over to where the tracks were laid. Named after the prominent local plantation owner Robert Calvert, the town flourished during the short time it was the northern terminus for the Houston & Texas Central Railroad. Enterprising businessmen flocked to Calvert soon after it was founded; by 1870, the town had 104 businesses. Due to its location in the Brazos Valley, Calvert’s economy was closely tied to cotton, the main cash crop of the region. The railroad greatly amplified the area’s cotton production as farmers now had an efficient way to ship their crop to market. As a cotton market town, Calvert attracted various merchants who sold goods to the area’s farmers. Not surprisingly, a number of Jews were among those attracted to Calvert. The Sanger Brothers, with their policy of following the route of the Houston & Texas Central Railroad, were probably the first, opening a store in Calvert in 1868, even before the first train rolled through town. Philip Sanger and his cousin Asher Mandelbaum ran the Calvert store for the brothers, who had several other locations in East Texas. The Sangers were soon followed by other Jewish merchants, including H. Dreyfus, A. Hirschberg, Charles Jacobs, L. Levy, Rudolph Oscar, E. Keifer, J.M. Pearlston, Adolph Zadeck, and several others, who all lived in Calvert by 1870. In that year, an estimated 16 Jewish-owned businesses lined Calvert’s downtown streets. Most of them owned dry goods or clothing stores. The high hopes people had for Calvert in 1870 never materialized. By 1878, many of these early fortune-seekers had left, including the Sanger Brothers, who closed their Calvert store as they consolidated their retail empire. According to Dun & Company, by 1878, only 52 businesses remained in Calvert, only half the number that existed eight years earlier. The number of Jewish-owned businesses dropped in half as well, with only eight in 1878. This turnover in the Jewish community reflected the instability of a boomtown. When Calvert was no longer the terminus, much of the economic activity moved northward with the railroad. Yet, a handful of Jewish families remained in Calvert for the next several decades, establishing a small but active community. The yellow fever outbreak of 1873 was the initial impetus for the Jewish immigrant merchants of Calvert to organize. During the crisis, they created the Calvert Hebrew Benevolent Society, acquiring land for a cemetery. Four Jewish victims of yellow fever were the first burials in the cemetery. The first national notice the Calvert Jewish community received was a published letter by society president Abraham Eppstein sent to the American Israelite newspaper in 1873 thanking the Galveston Hebrew Benevolent Society for their assistance during the crisis. The Galveston society had sent physicians, nurses, and supplies to help the people of Calvert. Despite this enthusiastic start, the Calvert Hebrew Benevolent Society never succeeded in constructing a synagogue or hiring a full-time rabbi, as the Jewish community did not continue to grow. Nevertheless, they did hold services on the High Holidays in a rented room, often led by Abraham Eppstein, a devout Jew from Bavaria who was in the cotton trading business, until his death in 1891. By 1900, the group had 50 members and continued to hold High Holiday services and religious school. By 1907, Calvert Jews had established a B’nai B’rith Lodge named in honor of Philip Sanger. Although the Jewish community never reached the potential foreseen by Rabbi Voorsanger in 1880, a handful of Jewish families continued to call Calvert home in the 20th century and Jewish businessmen played a leading role in the local economy. Julius Bedach, a native of Wollstein, Germany, came to Calvert soon after the town was founded, opening a dry goods store. His son Gerson remained in Calvert as a cotton buyer as late as 1930. Rudolph Oscar left Poland in 1859, opening a dry goods store in Calvert by 1870. Oscar became a prominent local businessman, constructing several brick buildings in downtown Calvert. 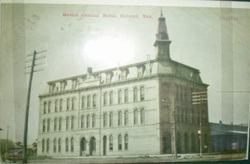 In the late 1880s, he built the four-story Grand Central Hotel, the most prominent hotel in Calvert. When Rudolph died in 1905, his wife Emma took over management of the hotel. Their son Henry Oscar served as the county tax assessor before later taking over management of the hotel. Rudolph’s younger brother Isadore joined him in Calvert, opening his own dry goods store. 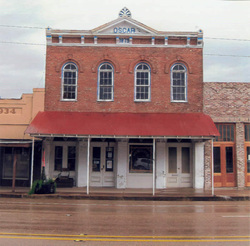 The store moved into the new Oscar Building in 1879, which still stands today. His son, Isadore, Jr. took over the business when his father died in 1901. In 1880, a Calvert Jew wrote to the American Israelite, reporting that of the 20 or so Jewish families in town, “nearly all of them [are] well to do and highly esteemed by their gentile townsmen.” Indeed, that year, both Rudolph Oscar and Abraham Eppstein were elected to the Calvert city council at the same time. In 1910, an agent for the Texas Jewish Herald visited Calvert and reported that the 18 Jewish families who lived there were “all doing well in a material way.” Yet they still had no building or rabbi, and continued to meet only twice a year on the High Holidays, bringing in people from larger cities to lead the services. The Ladies Cemetery Society looked after the Jewish cemetery. Indeed, the correspondent singled out the Jewish women of Calvert for praise, including a Mrs. Wise “who never fails to contribute to a worthy Jewish charity with a free hand,” and Bertha Abrams and Fannie Casimir “whose interest in Jewish matters never ceases.” Despite the efforts of these women, Calvert’s Jewish organizations remained relatively inactive in the early 20th century. Although they did not meet for regular religious services, the Jewish community of Calvert was very active socially. The social column of the Texas Jewish Herald details the many card parties and automobile outings held by Calvert Jews in the 1910s. When the members of B’nai B’rith held their monthly meetings, they often gathered in private homes, playing cards and serving refreshments once business was completed. During one 1910 meeting held at the Grand Central Hotel, the women visited and played cards while the men discussed B’nai B’rith matters. Calvert Jews were not isolated, but were part of a statewide social and kinship network of Jews. The Texas Jewish Herald reported how Calvert Jews often visited relatives and friends in other Texas towns, and entertained many out -of-town Jewish guests. Although the newspaper’s Calvert report contained little or no mention of religious services or a congregation, it detailed a small, but socially close-knit Jewish community. By the 1910s, Calvert was in serious decline. The arrival of the boll weevil and low prices severely damaged the local cotton economy. In 1938, Calvert’s big cotton gin and oil press went out of business, marking a symbolic end to the town’s economic promise. As cotton farmers’ fortunes diminished, so did those of the Calvert merchants who relied on their business. By 1937, only 27 Jews still lived in Calvert, and their numbers would continue to decline over the years. 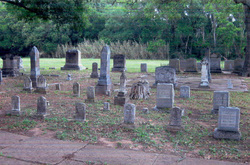 ​Of the 125 people buried in the Calvert Jewish cemetery, two-thirds died before 1930. The town, which peaked at 3,300 people in 1900, had dropped to 2,000 by the mid 1920s. This slow decline has continued; in 2010, only 1200 people lived in the town. The last Jew in Calvert, Marium Oscar, a descendant of the once prominent Oscar family, died in 2004.